Hello, forex friends! The U.S. non-farm payrolls (NFP) report will be released tomorrow at 12:30 pm GMT, which means that the Greenback will very likely get a volatility boost. That also means that it’s time for another edition of my classic NFP Event Preview, so gear up for this top-tier event by reading up. If y’all can still recall, I noted in my Event Preview for the March NFP report that leading indicators were pointing to stronger overall jobs growth in March, which is not in-line with consensus. However, I concluded that probability was likely skewed more towards a downside surprise for non-farm payrolls since historical data showed that jobs growth usually slows between February and March. Moreover, economists tend to overshoot their guesstimates, resulting in more downside surprises. 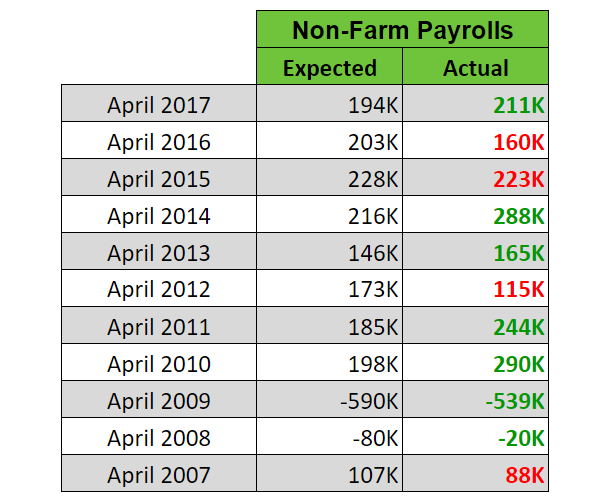 And as it later turned out, we did get a downside surprise since the March NFP report only printed a 103K increase in non-farm jobs, a much weaker reading compared to the +190K consensus. And while it’s a good thing that the reading for February was upgraded from +313K to +326K, there’s also the fact that the reading for January was downgraded from +239K to +176K. So, that’s a 13K increase from the upgrade and 63K decrease from the downgrade, which means that there were 50K less jobs than originally estimated. Other than the weaker-than-expected jobs growth, the jobless rate was also a disappointment since it held steady at 4.1% instead of improving to 4.0% as expected. The labor force participation rate, meanwhile, eased from a five-month high of 63.0% to 62.9%. The only good news was from wage growth since average hourly earnings increased at a faster 0.3% pace (+0.1% previous). However, this was within expectations. And since the other aspects of the NFP report failed to impress the Greenback found itself getting swamped by sellers. For the upcoming NFP report, most economists forecast that non-farm employment grew by around 190K in April (+103K previous). In other words, the consensus is that jobs growth picked up the pace. This increase in non-farm jobs is also forecasted to be strong enough to push the jobless rate down from 4.1% to 4.0%. As for wage growth, the consensus is that average hourly earnings increased at a slower pace in April (+0.2% expected vs. +0.3% previous). Markit’s manufacturing PMI report noted that “employment growth softened slightly, with the pace of job creation dipping to an eight-month low.” Input prices also “accelerated to the sharpest in almost seven years.” However, this was attributed to “Greater global demand for raw materials and recently introduced tariffs,” rather than higher wages. ISM’s manufacturing PMI report corroborates Markit’s findings since the employment sub-index dropped from 57.3 to 54.2. ISM also corroborates Markit’s findings with regard to input prices since ISM’s prices sub-index rose from 78.1 to 79.3, which is the “highest level since April 2011.” Like Markit, however, ISM attributed the rise in input prices to higher raw material costs. 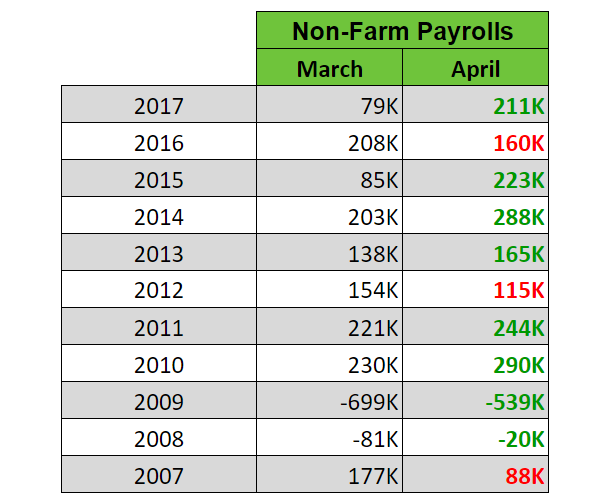 The ADP report revealed that private non-farm payrolls increased by 204K in April, a weaker reading compared to March’s +228K. And a closer look at the details show that both the manufacturing and services sector printed weaker jobs growth compared to March. ISM’s non-manufacturing PMI report isn’t out yet so we’re kinda handicapped on this one. With that said, the available leading labor indicators are pointing to weaker jobs growth in April, which is contrary to the consensus that jobs growth accelerated in April. Well, the consensus that jobs growth picked up the pace apparently has a historical basis. Even so, economists also tend to be too pessimistic with their guesstimates, resulting in more upside surprises. As for wage growth, the consensus that wage growth will decelerate also has a historical basis. However, economists have a bad habit of being too optimistic with their guesstimates since there have been a lot of downside surprises in the past. Although economists have been getting it right in the past two years. To summarize, the leading labor indicators are pointing to a slowdown in jobs growth. This goes against the consensus that jobs growth picked up the pace. However, historical data lends more support towards the consensus. Even so, economists have a historical tendency to undershoot their guesstimates for jobs growth, resulting in more upside surprises. And that tilts probability more towards an upside surprise, at least with regard to jobs growth. As for wage growth, the available leading indicators don’t really offer any clues, other than pointing out that higher input costs were driven mainly bu higher raw material costs rather than higher wages. However, the consensus that wage growth slowed is supported by historical data. Having said that, economists also tend to overshoot their guesstimates, since there have been a lot of downside surprises. But as mentioned earlier, they have gotten it right in the past couple of years. Still, that does skew probability more towards a downside surprise for wage growth. Anyhow, just keep in mind that we’re playing with probabilities here, so there’s always a chance that non-farm payrolls may print a downside surprise while wage growth surprises to the upside. And as always, just remember that traders usually (but not always) have a knee-jerk reaction to non-farm payrolls, with an upside surprise usually triggering a USD rally while the downside surprise usually results in the Greenback getting smacked lower. And the Greenback’s reaction to the previous month’s NFP miss is a classic example of the latter. However, make sure to keep an eye on wage growth as well since that’s more directly linked to inflation and may dictate follow-through buying or selling. Okay, that’s about it. By the way, if news trading ain’t your thing or if high volatility makes you uncomfortable, then remember that you always have the option to sit on the sidelines and wait for things to settle down.